One of Brisbane's best known streets is Laurel Avenue at Chelmer. In fact, because of its river frontage and large allotments, it was voted Brisbane's best street in 1999. An early house built there was Waterton, owned by local insurance executive Thomas Beevor Steele, who bought one and a half acres of land in March 1900 and erected the house shortly afterwards. Here is a photograph of it from 1906. Waterton still stands, but has had several identities since it was built. In 1913 it was acquired by AE Harding Frew, a prominent local engineer who was later to design the William Jolly Bridge and also to work on the Hornibrook Bridge. He lived in the house until around the year 1939, when unfortunately he was bankrupted and the house was sent to auction by mortgagors. It did not sell, and was subsequently picked up by the Australian Red Cross Society for the ridiculous sum of £2000. They intended to use the building as a convalescent home for WWII's returning service personnel, and the building was renamed as the Lady Wilson Red Cross Convalescent Home. Here is a photograph from 1944. 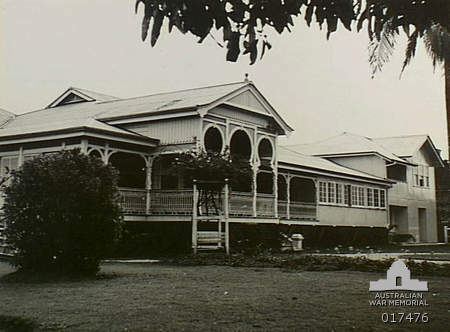 The convalescent home was closed in the early 1950s, and the property was leased to the Australian Military Forces from 1953 for use as a barracks for the Women's' Royal Australian Army Corps. The Red Cross retained ownership, and during 1965-6 they cut off much of the surrounding land for subdivision into housing allotments. After a new facility was built for the WRAAC at Kelvin Grove, they moved out of this building in early 1969, and the building was sent to auction by the Red Cross in May of that year. Once again it did not sell, but at the end of the year it was purchased. 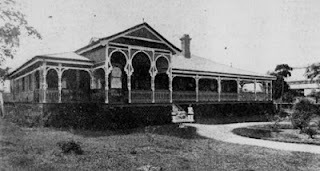 The new owner was the Queensland Police Force, and they opened it as a training facility in January 1970. It is now known as the Queensland Police College, and here is a current photograph.